Silver returns to the past to warn Knuckles about the coming dangers of Dr. Eggman’s newest weapon, the Phantom Ruby, but is it already too late?! High upon the floating Angel Island, Knuckles lounges by the Master Emerald reflecting on the value of rest and relaxation between the myriad adventures into which Sonic tends to draw him. However, his leisure time is cut short when Silver appears out of nowhere and begins to warn him about something concerning Eggman. Knuckles cuts him off, unconvinced he is not dreaming since Silver had long since returned to the future. Silver assures him that he is real, and that he has a dire warning. Knuckles continues to act incredulously as he points out that Angel Island has now disappeared and ancient Pachacamac Village has replaced it. Silver replies that he has no idea what is going on but to watch out because Chaos is right behind Knuckles. Once again Knuckles brushes it off, claiming that Chaos is peaceful and harmless now, right before the creature sucker punches him in the jaw. Silver scoffs at this claim and Knuckles retorts that Chaos just has a temper and that he can put him in his place. Knuckles attempts to subdue Chaos, but its amorphous body is immune to Knuckles’ attacks. Silver then steps in and attempts to immobilize the creature with his psychic powers, but Chaos launches an attack from Silver’s blind spot and stuns him instead. Together they attempt a joint attack to strike the creature’s weak spot, its brain. Just as the duo are about to strike, they suddenly find themselves back on Angel Island, Chaos and Pachacamac no where to be found. The two puzzle about what just happened, but Silver is certain that it is somehow related the great calamity that is supposed to soon occur. Knuckles then becomes convinced that his involvement must be crucial in stopping whatever is coming and vows to lead the resistance against it. Silver seems taken back by Knuckles’ declaration but vows to help him stop whatever it may be. Together, the pair leaves Angel Island and descends to the earth below to begin preparing for what may come. From the shadows emerges Dr. Eggman, holding a strange jewel. He laughs maniacally to himself, declaring his first test of the Phantom Ruby to be a resounding success and how unnecessary the Master Emerald is in light of the new power he has discovered. Finally, he concludes with the ominous declaration that not even Sonic will not stand a chance against its power. The second issue seems much more focused on directly setting the stage for the events of Forces than the first, glossing over some of the awkward hurdles that needed to be jumped to pull the characters and their motivations together in order to serve that purpose. In fact, there is a certain “meta” tone to some of the dialogue within this issue. It seems Flynn, who has been writing these characters for years now, was well aware of this as he attempted to contrive the required scenario ad hoc using the necessarily featured characters in the limited space of only 6 pages. It manifested as comedic effect when Knuckles and Silver banter about how Silver had already averted a future calamity and returned to his time once before. But what really stood out to me was Knuckles sudden and awkwardly resolute declaration that he must somehow be the key to stopping the vague and unknown calamity that is supposedly going to come to pass, and Silver’s absolute incredulity at this conclusion. Thus, the Resistance is born! Created to fight some nebulous, unforeseen, future event! Where are Silver and Knuckle going when they leave Angel Island? Who knows?! But they are going! Despite the awkward set up, we can conclude that our heroes confusion is caused by Eggman’s stress test of the Phantom Ruby and its manipulation of time and space. Eggman actually seems rather competent in the execution of his plan in spite of his usual grandiose failures, certainly throwing Knuckles and Silver for a loop. I believe this reveal is the punchline that somewhat redeems this issue and drew me as the reader into the intrigue of the Phantom Ruby and its mysterious powers. I said it concerning issue #1, I will say it now, and I will certainly say it about the other two issues as well, Adam Bryce Thomas is my favorite artist drawing Sonic right now. He has the, shall we say, SEGA official version of the characters down pat, and his action panels are on point, I particularly appreciate the fluid motion and shape of Chaos as he fights. For the more emotive characters, he also has quite the knack for great expressions which really bring the word bubbles to life. If anything, the art definitely outshines the story in this issue in my opinion. Unfortunately, I think the characters were rather poorly utilized in this issue because of the “meta” tone mentioned previously. 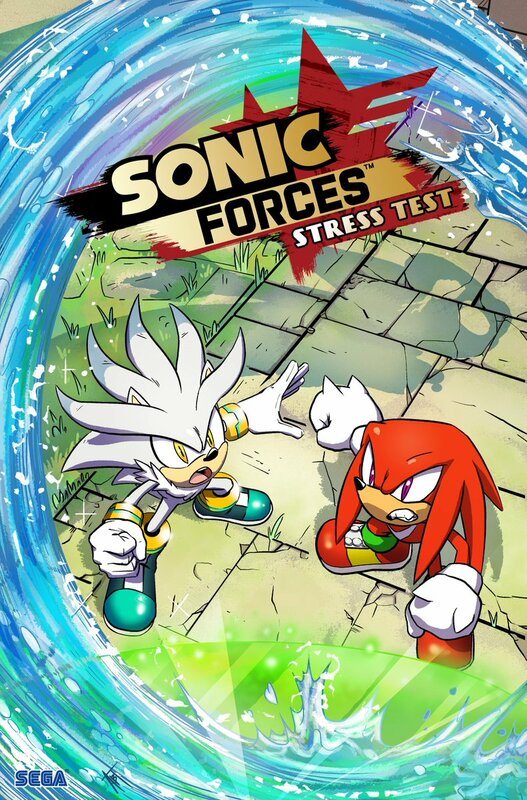 Silver and Knuckles remain confused and somewhat out of character throughout the short arc. Knuckles’ sudden and somewhat contrived conviction to “resist” the coming calamity seems extremely forced (sorry, had to), and in a display of yet an even deeper level of meta-narrative, I can see Flynn’s own facepalm to this plot device through Silver’s reaction. Otherwise, Chaos does what he does best, be an unstoppable, emotionless force of nature, but I think Eggman stole the show this issue. It is actually refreshing to see him succeed, even if it was only a test run. His confidence is foreboding, and the power of his new weapon makes me curious just what the extent of its capabilities is. Stress Test was definitely my least favorite of the mini-series, and I would rate it as a 5/10. While Eggman’s intent was to leave our heroes disoriented, the scenario still felt too meta and awkward. Overall, its flaws can be overlooked due to the forced context and short length of the comic that Flynn will presumably not have to deal with in a regular ongoing series. However, I feel this issue coasted along on the dynamic action panels and the fact that it featured two particularly popular characters. Beyond that, the reveal of the big bad himself pulling the string with a powerful new artifact is perhaps the most redeeming feature of the story, providing a intriguing cliff hanger that made me interested to play Sonic Forces. I hope you are enjoying my reviews for the Sonic Forces series so far! Check back in Monday for my review of Looming Shadow featuring Team Shadow, and check in daily for more IDW Sonic News!